Calling up a stranger on the phone can be intimidating. It’s like you’re on the bridge of a spaceship making first contact with an alien species. If the conversation goes wrong, you may end up causing an interplanetary incident. Or at least get yelled at. I used to work in a call centre as part of a customer relations team. Our job was to call customers who had complained about our company’s products and resolve the situation. When I first took on that job, I had doubts about my survival. How could I possibly talk to upset people every day? It turned out to be the best learning experience I have ever had. I now feel confident that I could ring up the Grand Poobah of Alpha Centauri and not break into a sweat. Why? Because I’ve learned how to master first contact. 1. Watch what you eat before you call. Never make an important call right after you have eaten a large lunch. Your body is too busy digesting to have any energy for brain work. And stay away from certain types of foods. Dairy foods, for example, can thicken up your throat and make it harder for you to speak clearly. Drink some water before you pick up the phone. And whatever you do, stay away from that spicy alien food! 2. Prepare your first sentence ahead of time. Think about your purpose for calling. After you get through the initial greeting, what is the first thing you are going to say? How will you start the conversation? Everyone is busy, so you need to cover off your key message in the first sentence. You could be selling services, responding to an inquiry, or asking nicely for those energy weapons to be pointed away from your ship. Whatever your purpose, plan it out so you don’t stumble on it during the call. 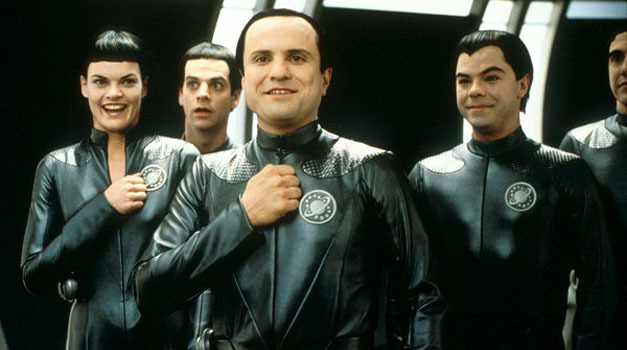 The friendly Thermians from Galaxy Quest haven’t quite mastered the human smile…but they’re working on it! 4. Start with a greeting. 5. Get the name right. No one wants to listen to their name get mangled. It doesn’t matter that there are no apparent vowel sounds in WxrtHltl-jwlpklz. That is no excuse. Look up the name, and if you can’t find it on the internet, take your best guess and go with it. Then ask, “Have I pronounced your name correctly?” before you speak any further. 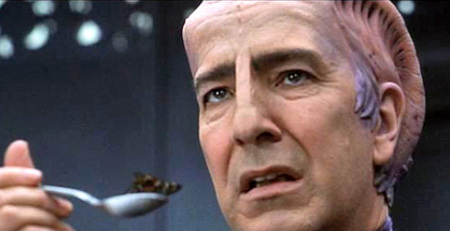 Now that I’ve covered off the secrets to a successful first contact, it’s time to go eat lunch. Mr./Ms. Reader, it’s been wonderful speaking with you. Thank you for your time. May you have a fabulous day! Great advice, particularly about the food. I’ve had a few phone conversations where people have burped at me throughout. That’s good advice about calling people out of the blue. Glad it was helpful, Sonia! Oh my god, it’s definitely a nerve wracking thing at first, calling strangers up. When I had to do it for an old job, I’d rehearse what I was going to say over and over again which only made things worse as I came out sounding like a robot. The smiling trick is a neat one though, I’ve definitely noticed the difference between smiling and being grumpy! Holy cow, Sue, this post is incredibly helpful! I detest the telephone, and avoid most conversations on it as the written word is certainly my preferred means of communication. But now armed with something as wonderful as your guide … I may just answer the phone. Or someday make a call myself. Thanks! Now I’m wondering how your name gets mangled…I’m sure I’ve been pronouncing it wrong in my head all this time! Is it Jan-da or Jahn-da? Or something else? I once had a customer with a French last name, which I was careful to pronounce correctly – then was told that this was wrong (the family pronounced it in an anglicized way). You just never know!